Today Stephanie and Jeremy celebrated the Dragon Boat Festival with the rest of the Infants School (K-2). The infants children were allowed to go to school dressed in their national costumes, and there was a special assembly where the children sang "I Can Sing A Rainbow" in both English and Mandarin. Students from Year 3 performed a Chinese play about the meaning of the Dragon Boat Festival, and students from Year 2 presented a Chinese poem, a Chinese Dance and a Korean Dance. 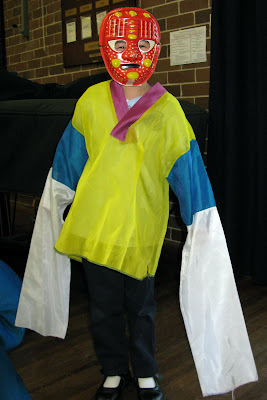 Jeremy was pleased to watch Stephanie in the Korean Dance! He must have been too excited about the special events at school today, because tonight he woke up with another low grade fever! No school for him tomorrow!